Evaluate the polices the government should adopt if it wishes to achieve a low level of unemployment. 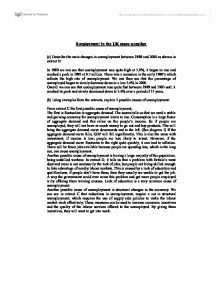 Employment in the UK essay question (a) Describe the main changes in unemployment between 1989 and 2000 as shown in extract B: In 1989 we can see that unemployment was quite high at 5.9%, it began to rise and reached a peak in 1993 at 9.7 million. There was a recession in the early 1990's which reflects the high rate of unemployment. We can then see that the percentage of unemployed began to slowly decrease down to a low 3.6% in 2000. Overall we can see that unemployment rose quite fast between 1989 and 1993 until it reached its peak and slowly decreased down to 3.6% over a period of 11 years. (b) Using examples from the extracts, explain 3 possible causes of unemployment: From extract C the first possible cause of unemployment, The first is fluctuation in aggregate demand. The source tells us that we need a stable and growing economy for unemployment levels to rise. Consumption is a large factor of aggregate demand and this relies on the people's income. So if people are unemployed, they will not have as much money to go out and buy products. This will bring the aggregate demand curve downwards and to the left. ...read more. This could happen in a down turn or a recession (see diagram 2). There are several policies the government could enforce to tackle the problem of unemployment. Firstly, they could cut interest rates in order to boost the AD; this would be using the monetary policy. In cutting interest rates, it would boost consumption and investments and in theory should move the AD curve outwards and to the right. Thereby, hopefully increasing the availability of jobs. The government aims to set interest rates with the objective of keeping inflation close to the target of 2%. The monetary policy can be enforced relatively quickly; however, it can take time for policies to influence aggregate demand. It is estimated to take 18 months before a change in interest rates will affect consumption and investment. So this policy seems to be more of a quick short term effect rather than a sustainable one. Another possible policy is to use the fiscal policy and increase government spending. The government usually spends money on education, health, defence and social security. The government can raise the AD by increasing spending. ...read more. If people are more skilled, they will be available for new jobs in different sectors. In doing this, it should hopefully shift the long run aggregate supply to the right. (See diagram 3) A reduction in unemployment benefits, would give people an incentive to seek more work and accept lower wage rates, thereby reducing unemployment levels, however some argue that cutting benefits would reduce AD and output. Supply side policies are selective and are targeted at particular markets to raise economic efficiency. Many agree that if these policies achieve their goal, it will make it easier for the government to then achieve its aims of reducing unemployment. Increasing AS allows AD to rise over time without the risk of inflation. However, there is the problem of not knowing how workers would respond to cuts in wages or benefits. Also some of these policies would take a long time to have an effect on the economy. From my point of view, I believe that the most effective policy to enforce would be to cut interest rates and taxes. It would give people more incentive to spend in shops and on investments. This would then create more jobs, which would then reduce the level of unemployment. I feel it would be most effective and efficient. ...read more. The three main policies the government can use and 'manipulate' are the monetary policy, the fiscal policy and the tax system in order to obtain and sustain low levels of inflation. The monetary policy uses changes in interest rates to control the demand for money and therefore the rate of increase of bank lending. If employees wages were to increase, then a higher percentage of their wage will be taxed, leaving them with a smaller amount to buy goods and services, this would restrict their buying power and therefore would decrease the total demand within the economy. The ways these work is that if national income rises then so too do tax revenues, this in turn means that government expenditure will decrease, which therefore means an increase in the level of national income. The national level of income will vary depending on the amount taxes change with income. wages and consequent improvement in standard of life and an increase in national unemployment. It also suggests that there are fewer jobs available at these higher wages. To back up this hypothesis, we can look at the implications of the new legislation in terms of demand and supply and their respective elasticities both in the short and long term. The worker could take the first job that he/she is offered, but it is probably better, for the individual and the economy as a whole, if he/she takes some time to find the right job, so that he/she is more productive in that job. This increased borrowing from the Federal Reserve introduces more money into the system; as McConnell & Brue describe it, ?borrowing from the Federal Reserve Banks by commercial banks increases the reserves of the commercial banks and enhances their ability to extend credit? (2004).